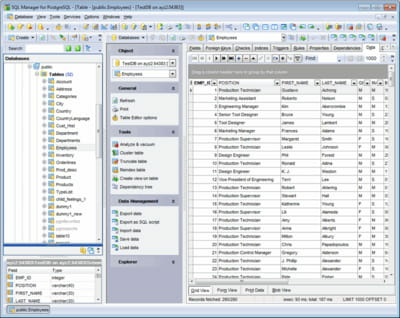 EMS SQL Management Studio for PostgreSQL is a software used for database administration and development. It has many features but some of them will be detailed in the following lines. SQL Management: The software enables the user to perform different actions in data management. He can for instance create queries with the SQL text editor, search objects or filter them to easily have a sight on them. Import/ export: EMS SQL Management Studio for PostgreSQL also offers the possibility to import and export data. It supports many formats like HTML, MS word, MS Access and much more. He can also specify the setting for each file format. Database extract: The program also has the ability to backup data in form of SQL scripts. It can save data structure and the user can choose whether to do this fully or partially. Scheduling: EMS SQL Management Studio for PostgreSQL has a task scheduler function in which the user has just to define the moment of the process as well as the tasks. It also sends him a notification when it is done. It is available in different languages. It is easy to handle with its user friendly interface. This is a trial version of EMS SQL Management Studio for PostgreSQL. Latest update on July 6, 2015 at 01:01 AM.